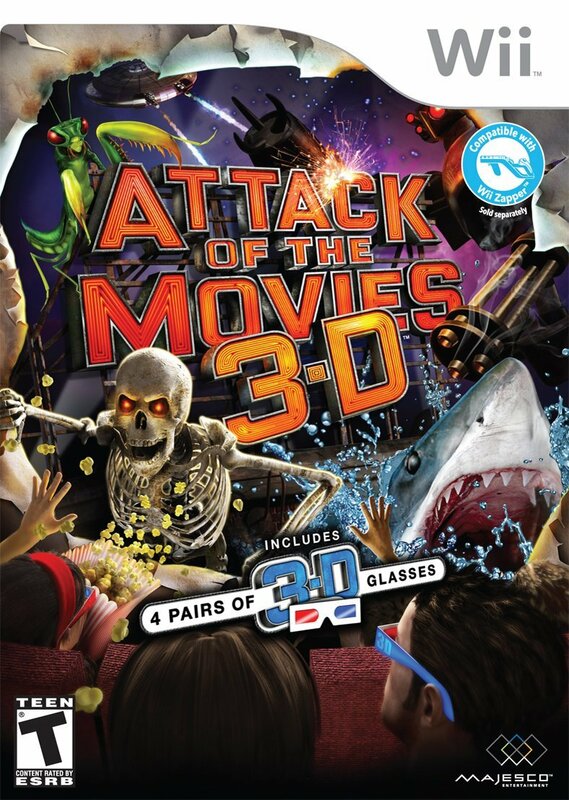 The 3-D movie craze continuing at the box office predictably migrates to video games in the action shooter Attack of the Movies 3D. Appearances mean everything for players longing for sharp graphics but the 2D option and challenging layouts still allow for some decent, mindless arcade fun. This enjoyable “pick-up and play” game includes four pairs of 3D glasses and features multiple weapons. The “cereal box” glasses do not resemble the modern specs in movie theaters and players cannot switch weapons during gameplay, so game developers already have an uphill battle for a complete success here. The limited weapon cache also reduces the strategy level. Players use the Wii remote, Zapper, or game controller to conquer each scenario varies among six themes that echo familiar film franchises – insect invasion, robot rebellion, cosmic combat, deep-sea danger, into the emperor’s tomb, and graveyard gunfight. Players can easily reload with a shake and switch the 3D option on or off at the main menu or in the pause menu any time. The four player multiplayer mode lets everyone get in on the action, but the lack of crisp graphics and the outdated glasses produces an average experience overall. This game also runs a bit short in overall time and challenge, but the affordable price can likely offset the vices for most players (** out of four stars, rated T for animated blood and fantasy violence, also available on the Xbox 360). This entry was posted in Video Game Reviews and tagged 3D, Michael Siebenaler, Mike Siebenaler, Tall Writer, video games, Wii. Bookmark the permalink.